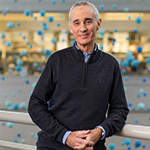 Alan Schwartz, MD, serves as medical director of the Johns Hopkins Sleep Center on the Bayview campus in Baltimore, Maryland. Defining himself as part clinician, part researcher, and part professor, Dr. Schwartz says his primary academic focus has been to diagnose and treat sleep-disordered breathing, with a special emphasis on mechanisms of upper-airway obstruction during sleep. One of his major initiatives has been to establish a sleep research laboratory at Hopkins. Launched in 1999, the Center for Interdisciplinary Sleep Research and Education draws investigators from around the world to conduct research and clinical trials. Dr. Schwartz and his colleagues have also spent the last decade developing novel mouse models of obstructive sleep apnea. Dr. Schwartz first became interested in sleep medicine in the mid-1980s. After attending medical school at Johns Hopkins, he completed his residency at Mt. Sinai Medical Center in New York and then returned to Hopkins for training in pulmonary and sleep medicine. What does Dr. Schwartz find most rewarding about medicine? In the next few months, Dr. Schwartz is taking the next steps with Sueño Perú (“Peru Sleep”), a project designed to assess sleep-disordered breathing in underserved communities abroad. His team has surveyed sleep-disordered breathing patterns in a large Peruvian cohort, and he looks forward to launching a public health strategy for mitigating sleep-disordered breathing in Peruvian highlanders. He has a strong personal attachment to the country. He and his wife, Carla, spent time there together as medical students, and they have kept in close contact with Peruvian friends and colleagues. Dr. Schwartz and Carla live in the heart of Baltimore and enjoy cultural opportunities there, including the symphony and local theater. They have two grown children: a son, who is finishing medical school at the University of Chicago, and a daughter, whose work involves promoting sustainable living and energy-efficiency programs in Baltimore. In his free time, Dr. Schwartz likes to cycle, sail, and jog.